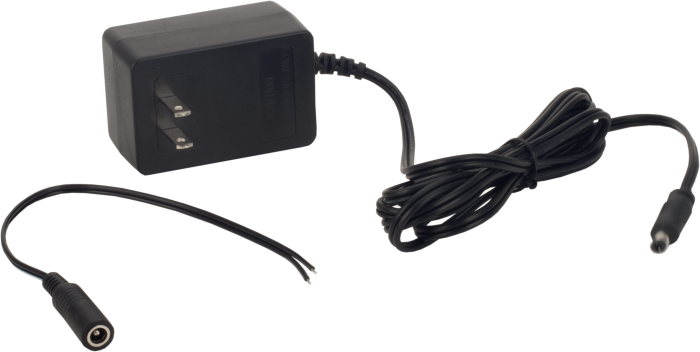 This wall charger is used with our CR200-series dataloggers. On one end, the 15988 has a plug that inserts into an ac wall socket. On the other end, it has pigtails that insert into the charging terminals of a CR200-series datalogger. Note: The 15988 is not intended for use in powering the PS100, CH100, PS150, or CH150 power supplies. For this purpose, consider using the 29796 power supply instead. The 15988 is a wall charger used with our CR200(X)-series dataloggers. On one end, the 15988 has a plug that inserts into an ac wall socket and on the other end, it has pigtails that insert into the charging terminals of a CR200(X)-series datalogger. This wall charger is recommended only where AC power is available at the data logger's location. Please note that a white stripe runs down the insulation on one of the two pigtails; the pigtail with the white stripe is the positive (+) side. What size barrel connector is used on the 15988? The 15988 has a female 5.5 mm x 2.5 mm barrel connector. The included extension has a male 5.5 mm x 2.5 mm barrel connector.